Corgin are not unused to challenges, in fact you could say we thrive on them, and there are many experienced in the dust suppression field. One such challenge was a recent project for a high-profile client who are global leaders in the mining and processing of minerals, producing speciality products for industry. At their storage facility in Staffordshire, UK, various powder clay products are discharged from a train into a series of storage bays. 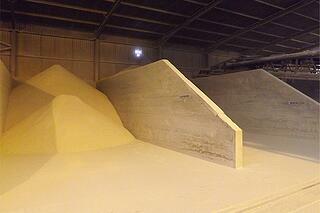 Some of these products have already been through drying processes and have a consistency similar to talcum powder. When discharged from a height of several metres into the bays, you can imagine the high level of fine airborne dust that results. Extraction was considered, but was not a viable option in such a large open area. The particular challenge came when the client advised that the moisture level of the product absolutely must not be interfered with. Any discernible increase in moisture content as a consequence of the suppression would adversely affect the quality—and hence the value—of the product. Even with our experience across a wide variety of industrial applications, this was going to be difficult to get right, but we felt we could do it. Given inevitable scepticism on the client’s part, we took the unusual measure of offering a no-obligation, ‘Work-or-Return’ trial of an AtomisterAiro system. Each atomiser has a vast spectrum of adjustment, ranging from around 2 litres per hour up to 10. From 'dry dust suppression' barely more than a humidification spray at its lowest setting, to a relatively coarse atomised spray at its highest, almost any level of suppression can be provided to suit the specific requirements of each application. 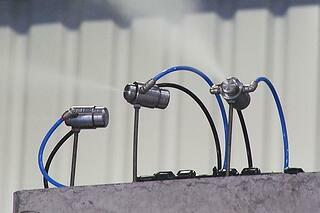 In this case, particularly careful attention had to be given to the positioning and spray setting of each atomiser. Following initial commissioning, some further system adjustments were required, while the client sanctioned a series of monitoring tests, both of the dust level in the air and the moisture content in the product. We are delighted to say that the 'impossible' was finally achieved. In the final reckoning, there was no discernable increase in moisture content. So, given the ultra-fine level of atomisation, how effective was the system in achieving its ultimate objective, i.e. reducing airborne dust to an acceptable level in the building? The jury is out and we invite the comments of our readers, but we felt that was a highly satisfactory outcome in the circumstances. The client evidently agreed and has now proceeded with the purchase of a more extensive, permanent AtomisterAiro system installation—which is still performing to his full expectations. So when someone next suggests to you that dust suppression with water mist is a sure precursor to wet floors, wet product or wet process equipment...remember AtomisterAiro.